The TW 150DHB first came into production in 1995. 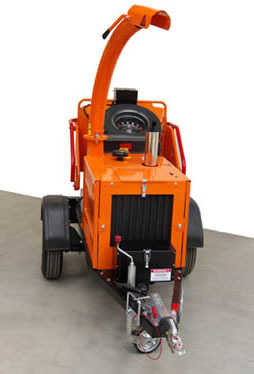 In 1997 the machine became the top selling professional chipper in the UK. The 150DHB engine is a 35hp water cooled Kubota diesel, it's fuel tank capacity is 18 litres (4 gallons). The towing weight of the chipper is 737kg. With the hopper folded up the length of the chipper is 3025mm - when working its length is 3665mm. The height (inc. discharge) is 2260mm. The Max infeed dia. is 150mm (6"). Its twin hydraulic feed rollers will take up to 4 tonnes per hour.